Ever since Marvel's Annihilation comic event, I had become rather enamored with the more "cosmic" side of the Marvel Universe. It's this side of the creative environment that lead to the development of the Guardians of the Galaxy after all and so there's a lot of good to be found here. 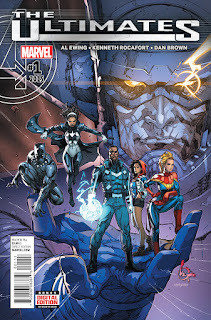 One of the more recent efforts to continue telling stories at this level of Marvel's narrative is The Ultimates, which is a distinct effort to have some of Earth's mightiest heroes take a better stab at hitting above their weight class, in a manner of speaking. My biggest complaint about recent Marvel stories has been the increasing frequency of having the Avengers and other very Earth-based heroes get involved in big unvierse-spanning events involving some very powerful artifacts. It's not impossible but isn't the most logical direction to take things. But comics like this one seem to be a direct answer to this as it features heroes who stand a chance of having a more galaxy-spanning perspective on things. It's not perfect, but it was pretty fun. Synopsis: The Ultimates is a Marvel comic book series created by writer Al Ewing and artist Kenneth Rocafort. This first volume ran for 12 issues before coming to a conclusion. 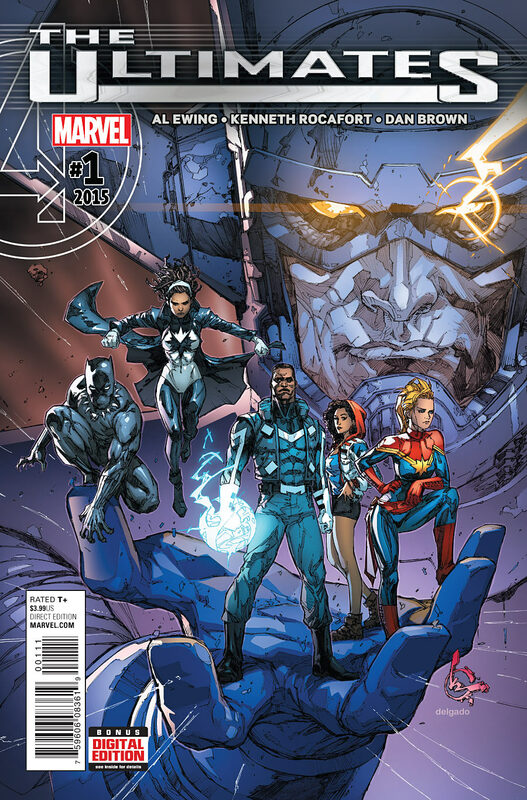 Under the leadership of Carol Danvers yet outside her international mandate as head of Alpha Flight, the Ultimates are a collection of the Earth's greatest minds. This includes the leader of Wakanda Black Panther, the brilliant Blue Marvel, the once Captain Marvel Monica Rambeau and the universe-traveling Ms. America. Their direction is to find a way to more proactively deal with possible threats to the future of the human race. And their first decision is to deal with the world-eater himself, Galactus. Given their combined intelligence and unique skills, they figure that there has to be a way to neutralize the world-eater from ever becoming a possible threat. But how they'll manage this and survive to tell the tale is the crux of this story. What I Liked: The very nature of the Ultimate makes for a fascinating story premise. You have heroes who possess both significant superhuman abilities ranging from energy manipulation to being strong enough to punch holes in reality, yes, but they're mostly quite smart. And thus their solutions don't just involve beating up bad guys but they also try to outthink their enemies and come up with more longer-term solutions that deal with their problems with a bit more finality. And the sheer ambition of the threats they face is kind of crazy. After all, they started with someone on the scale of Galactus, so who else could stand up to that? And while not all their threats of cosmic forces on that same scale, the writers did get rather creative in terms of looking for interesting characters to draw into the title in order to give the Ultimates appropriate "problems" to solve. What Could Have Been Better: The weird angle of the team being at odds with the Alpha Flight council was almost unnecessary in terms of the scale of the threats they were trying to deal with. And the fact that this odd conflict was later the reason for the team disbanding just didn't cut it. I sort of get it and it helped keep the team grounded, but in the long run it proved to be just another thing holding them back. Starting with Galactus was a really big goal and as much as they solved it, the resolution was a quirky one. And their next threats felt a little more personal, or at least tied to the personal history of the individual characters. On a weird side note, it was also tricky to get into this comic without knowing who the Blue Marvel is supposed to be and to understsand the full range of his powers. TL;DR: The Ultimates is a striking new team and one that certainly appeals to my nerdier side in terms of their approach to solving problems. This first volume is pretty short as far as comics are concerned but it's still a fun ride. And so the comic gets a good 4 blasts from the pace coming back to haunt the Ultimates out of a possible.